Beckingham Owl casts a watchful eye over The Green at Beckingham. 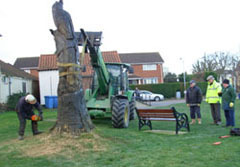 2 Ash Trees were due to be felled because of disease and Charles Fenton who felled one of the trees suggested the other to be made into a sculpture which after some thought the Parish Council agreed. 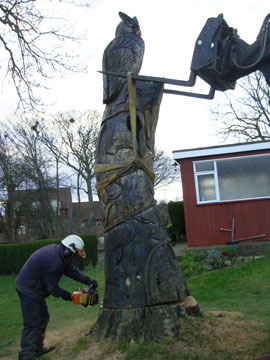 The Long-Eared Owl was made by Tom Harvey (Dryad Tree Care) who used a chainsaw and grinder to create his sculpure. 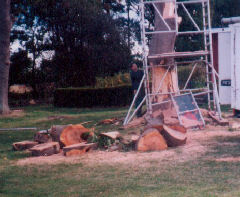 Work was started in October 2003. Scaffolding was put up around the tree and there was immense interest with people calling to chat and the local schoolchildren visited. 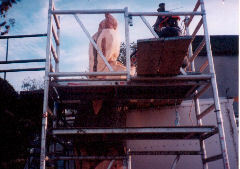 The making of the owl took 5 days and a competition to name it was won by Richard Steel who correctly named it as Theo. Theo was the name suggested by Tom Harvey (THEO wl). 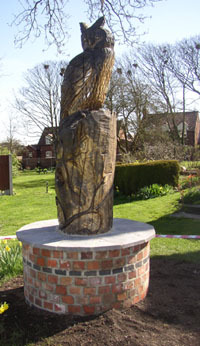 Theo was unveiled by Mrs Elsham (whose father had planted the three trees on the green) at the Carol Service held on The Green in 2003. 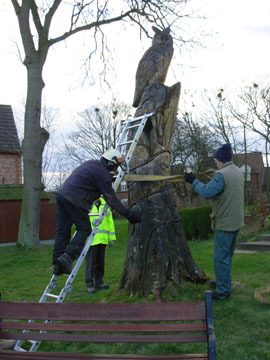 The owl is treated with Danish Oil yearly and originally stood 12 foot tall. 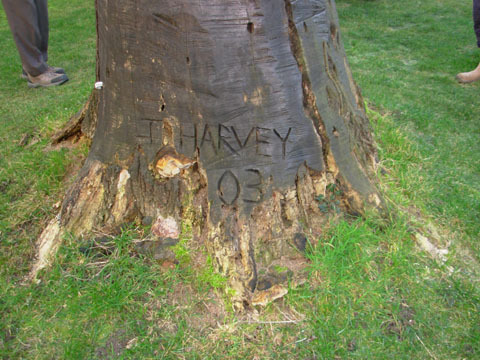 However major restoration had to be carried out in 2012. The village was at serious risk of losing Theo, when it was found to be rotting at the base making it unstable. 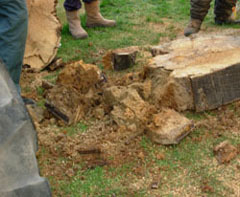 The Parish Council who own the land contacted a tree surgeon to inspect the damage and advise a course of action. 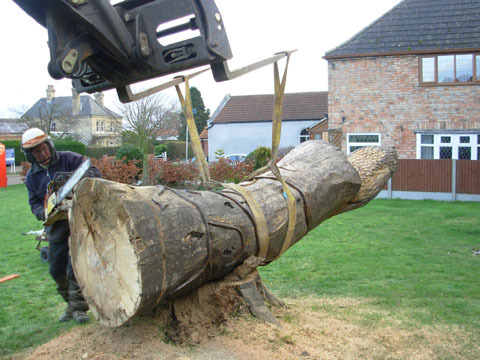 Unfortunately to do this it was necessary to cut the owl down and on inspection the damage was found to be rather severe. 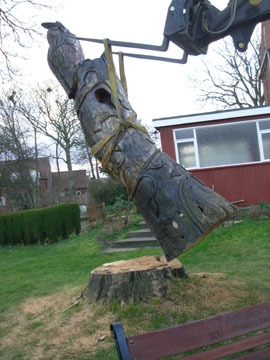 The base had almost been destroyed and reduced to dust by disease which was slowly moving further up inside the owl. 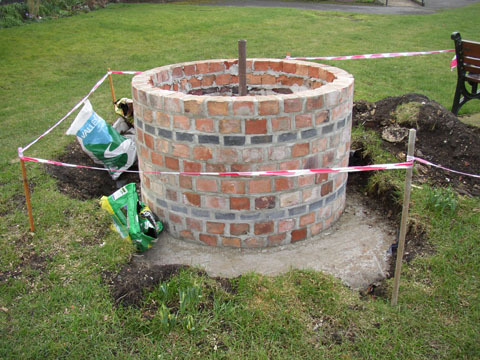 The Parish Council was advised to have four foot removed from the base and to have the remainder thoroughly treated. It was suggested that a plinth be built onto which the owl could be secured and would then probably last for another ten years. 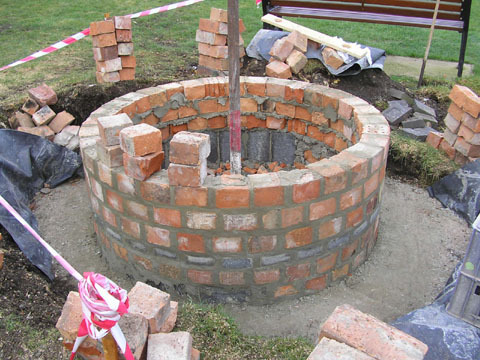 Not wanting the village to lose the popular attraction, this action was given the go ahead. So Theo was carefully taken away to be safely stored whilst a base was built for it to stand on as near to its original position as possible. 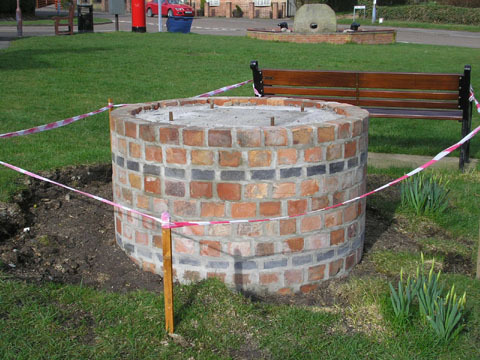 A circular plinth was constructed consisting of a brick surround filled with concrete onto which the owl is firmly secured. 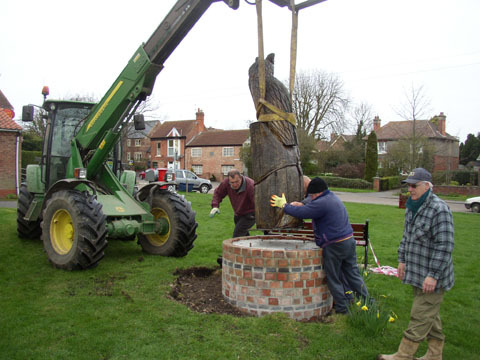 The plinth has been finished with paving slabs neatly cut to surround the base of the owl.The plinth work was carried out by Jonathan Heath and John Foster. Theo has now been returned to his rightful place, a little shorter than before, but still casting a watchful eye over the world. 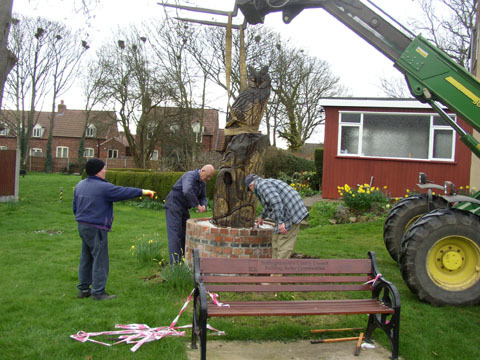 Hopefully it will now be possible for him to continue to be enjoyed, admired and respected by villagers and visitors alike for some years to come.